Lieut. Alvin Langham, son of Mr. and Mrs. S. A. Langham, of Tamalco, and a graduate of the Carlyle High School, who wisited friends here last week, received his wings as an army pilot and commission as a Second Lieutenant Feb. 8th, at Douglas, Ariz. He has returned to Fresno, Cal., a replacement center, and from there expects to be sent to another camp for additional training. Lieut. 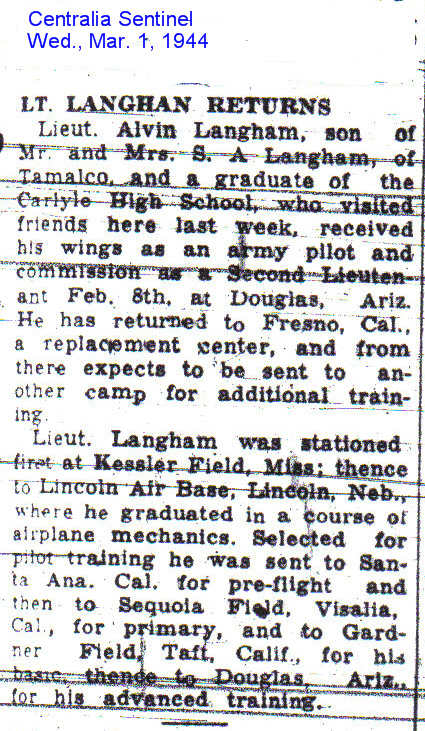 Langham was stationed first at Kessler Field, Miss; thence to Lincoln Air Base, Lincoln, Neb., where he graduated in a course of airplane mechanics. Selected for pilot training he was sent to Santa Ana, Cal. for pre-flight and then to Sequoia Field, Visalia, Cal., for primary, and to Gardner Field, Taft, Calif., for his basic, thence to Douglas, Ariz., for his advanced training.